The Devonshire Dome is one of Derbyshire’s premier banqueting venues, hosting some of the county’s most prestigious events. Suitable for banquets from 100 to 700 guests, the Dome can be configured to give a unique setting which is unrivalled in the region. We have designed a number of banqueting menus suitable for any type of event, however, our Head Chef is happy to design a bespoke menu for you if required. 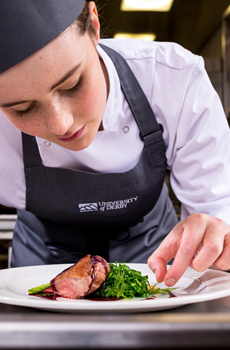 All of our products are locally sourced and our chefs keep up-to-date on culinary trends and developments so you can be assured of fresh ingredients and a contemporary twist to your food. Our restaurant is ideal for private dinners for up to 90 guests and offers a unique dining experience for your event.